West Virginia is one of the poorest states in the nation, and West Virginians face some of the highest rates of illness and disability. Among the few bright spots are public-funded programs like Medicaid and the Children’s Health Insurance Program (CHIP). The number of uninsured West Virginians has plummeted since the state’s expansion of Medicaid in 2014 under the Affordable Care Act (ACA). Today, almost a third of West Virginians are covered by Medicaid, with most of the cost paid by the federal government. PDF of full report. However, various efforts to transform the Medicaid program threaten the impressive progress West Virginia has made. Most recently, the federal government began allowing states to require people to work in order to receive Medicaid coverage. 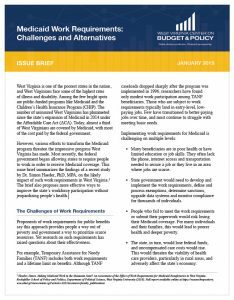 This issue brief summarizes the findings of a recent study by Dr. Simon Haeder, PhD, MPA, on the likely impact of such work requirements in West Virginia.